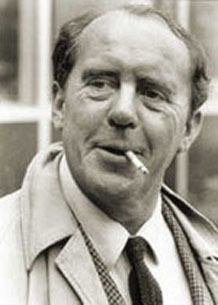 Heinrich Böll was raised in Germany between the World Wars, and said that he was repulsed by the rise of the Nazis. He stood firm against societal and peer pressure he never joined the Hitler Youth. Drafted into the German Army as a young man, he fought on the front lines in Poland, France, and Russia, and was shot four times and lost all his toes to frostbite. He was eventually captured and imprisoned by Allied forces. After the war he returned to half-destroyed Cologne, and lived in the ruins of his family home while working in his father's cabinet shop and, later, as a low-level city bureaucrat. His first novel, The Train Was On Time was published in 1949, telling the story of a German soldier assigned to the Eastern front who knows in his heart that the train is taking him to his own death. He was probably best known beyond Germany for his novel Group Portrait with Lady, in which war-time informants tell investigators about an affair between a German woman and a Russian prisoner of war. He was hailed as a master of postwar Trümmerliteratur, the "literature of the rubble", telling tales of ordinary Germans in the aftermath of the Holocaust. He was the President of International PEN, the writers' anti-censorship group, and Alexander Solzhenitsyn stayed at Böll's home after he was expelled from the Soviet Union. In 1972, when he was notified that he had won the Nobel Prize, his immediate response was "Really? I, and not Günter Grass?" Grass, another great postwar writer in divided Germany, won his Nobel Prize in 1999. Böll died in 1985, and left his papers, original manuscripts, and unpublished works to Cologne, city of his birth, where they were among the treasures destroyed in the 2009 collapse of the city's archives building.